Most of the people find airports monotonous, isn’t it? Time-consuming processes, long queues and n number of rules which are frustrating; the constant fear of missing your flight by a few minutes. Over the years technology has made processes like check-in, security check, baggage re-claiming, and immigration easier but still these are time-consuming processes and at some airports it can even take hours. Changi Airport in Singapore is an excellent example of how future airports will look like. It has brought the best of the best technology and services for making flight experience more relaxing for the passenger. It’s not just an Airport; it is a world of its own. 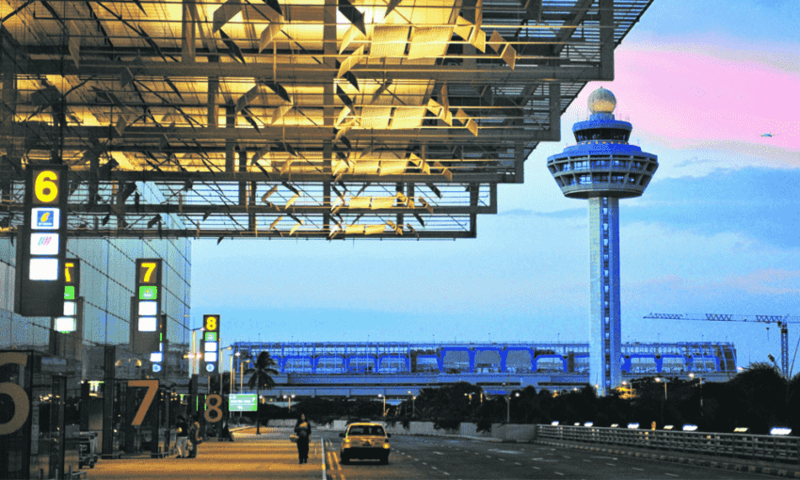 Changi has taken 566 “Best Airport” awards since it opened in 1981, including Skytrax’s “World’s Best Airport” nine times, including the last six years in a row. There are a lot of flashy amenities – a free movie theater, a butterfly garden, a rooftop swimming pool, and 24-hour spas are just a few. In fact, it has become an attraction for local people as well, and some of them just go to the airport to have dinner, do some shopping or hang out, even if they’re not flying anywhere. Changi Airport has 4 terminals and all of them provide facilities like car rental, pharmacies, free to use Rest areas, Ground transport concierge at the Arrival Halls, special Baby Care Rooms & free Wi-Fi of course. 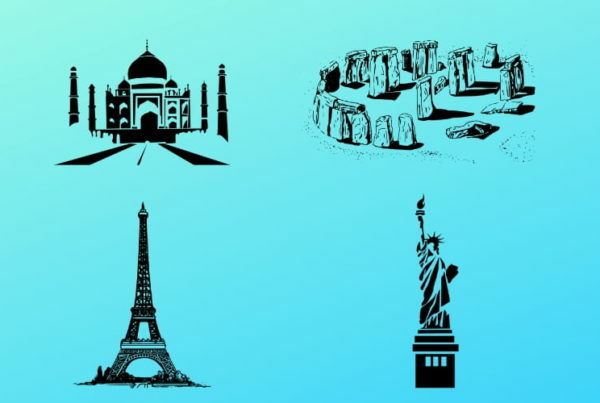 Each of them also has unique attractions that will leave you in awe. Every terminal at the airport has public art spread throughout. The airport has tons of shops and restaurants. If you buy anything on Changi’s online shop, you can have it shipped to the i-Shop kiosk and pick it up once you get through security. And I must tell you that Changi Airport offers a free Singapore tour. If you have at least 5.5 hours to 24 hours to spare till your connecting flight, you can join one of free 2.5-hour guided tours. The Heritage Tour runs five times daily and the City Sights Tour runs twice daily. For more information visit Changi Airport official website. Now let’s quickly take a glance at what each terminal has to offer its passengers. Opened in 1981, the upgraded Terminal 1 now serves up to 24 million passengers per year with a wider selection of shopping, dining and relaxation options. This terminal welcomes you with a garden where you will find a diversity of flora. The specially curated flora emulates a dragonfly habitat. On level 3 of the terminal is a cactus garden. Make yourself comfortable at the bar inside the garden and enjoy the beauty of cacti species from the lands of America, Asia, and Africa. The center of attraction is Kinetic Rain Sculpture. It is made up of 1,216 bronze droplets; each droplet has a dimension of 9.8m by 4m and can form 16 different shapes such as an airplane, a hot air balloon, and even a dragon. Its choreography is controlled by a set of high precision motors. The project is the brainchild of artists, programmers, and technologists who analyzed space, passenger flow, and the bustle of activity at the airport to create an artwork that enhances the identity of the Aiport. And if you’re a movie lover, then you should catch a movie at the free theatre at Terminal 1, this facility is available at Terminal 2 as well. Please keep in mind that even though it is 24 hours open but movie timings are fixed. So just make sure you arrive at the right time or you might miss some of your favorite dialogues. 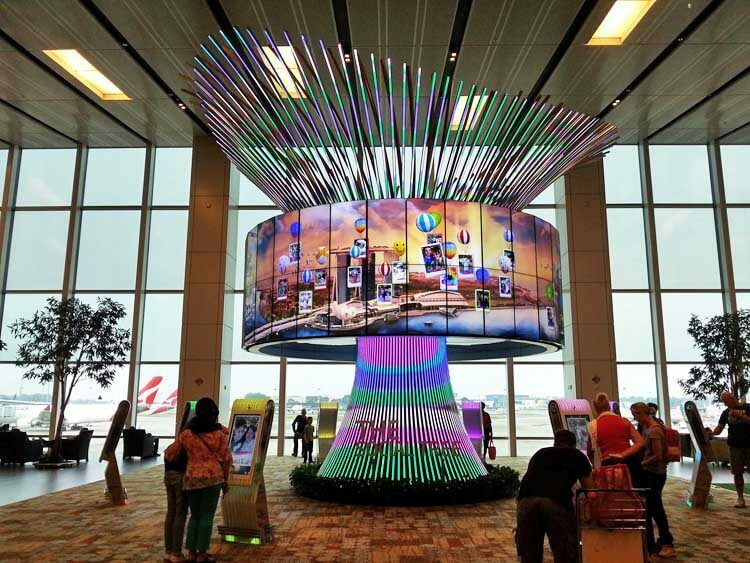 Also, don’t forget to upload your pictures and video memories of Changi Airport on 9 feet high “Social Tree”. 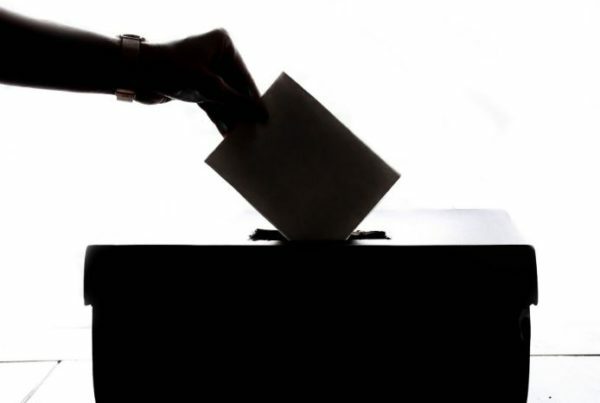 It is made up of 64 high-definition, 42-inch screens where you can upload picture and videos through a booth and be a part of the history. 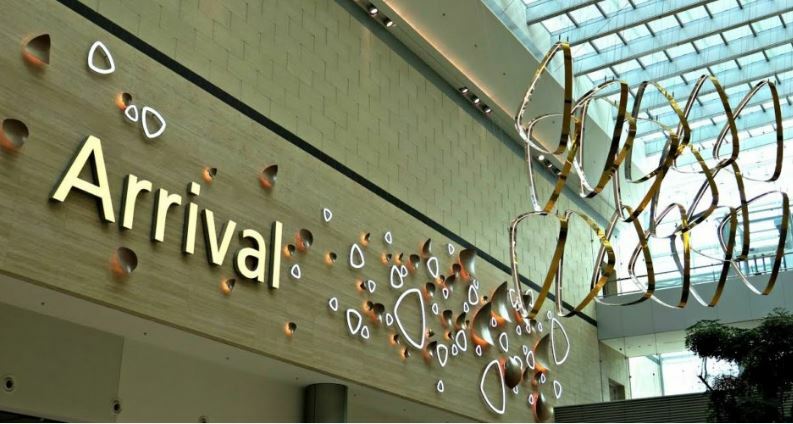 Opened in 1991, Terminal 2 has been revamped to be a non-stop entertainment hub. Visit a movie theatre, gardens, and more, while waiting for your flight. The garden has four giant glass bouquet sculptures filled with more than 300 freshly-cut flowers and soft ferns. These glass bouquets are decorated with over 56,000 colorful, hand-cut stained glass tiles that present a shimmering hue around the glass sculptures. The atmosphere comes alive with sounds of nature recorded from the rainforests of Borneo. Another eye-catching element at this terminal is “A Million Times”, minimalist and mesmerizing 2,200-pound kinetic sculpture created by Humans since 1982. From Humans Since 1982: “Each of the 1008 clock-hands (504-minute hands and 504-hour hands) are fitted with individual motors, giving the sculpture the ability to show various patterns, as well as the time and greetings in various languages across different times of the day. 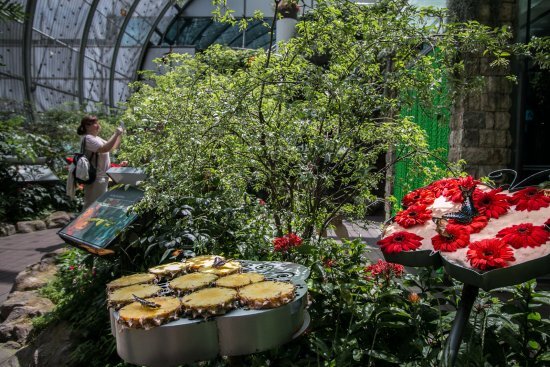 Opened in 2008, Changi Airport’s eco-friendly ‘green terminal’ lifts your spirits with natural skylight and gardens featuring over 200 species of foliage and butterflies. 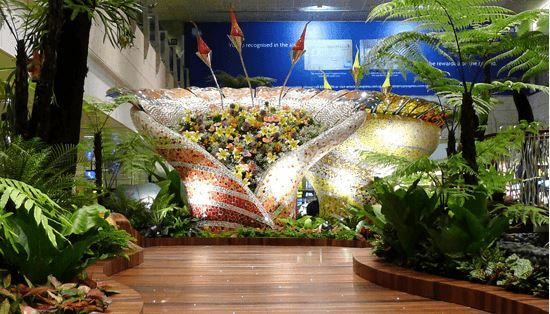 Changi Aiport proudly presents the world’s first butterfly garden in an airport. It is designed as a tropical butterfly habitat with a profusion of flowering plants, lush greenery, and a 6m grotto waterfall. And then “The Slide”. All the adventurous souls out there don’t miss this one. It is Singapore’s tallest slide and the world’s tallest slide in an airport, 12m tall (or four stories high). Hop into the tubular slide from Level 1 and take an exhilarating ride to basement 3. Inaugurated in 2017, Terminal 4 will bring you design and process innovations that will redefine your travel experiences. The concept behind Terminal 4 is to take all of the best elements from the airport’s other terminals and try to make as seamless an experience as possible. It costs $737.5 million to build and is packed with a ton of cutting edge technology to create a “contactless” experience. It is designed in a way that a traveler would be able to go from check-in to their plane without ever talking to another human if he or she wants. There are automated kiosks to check-in and print luggage tags and boarding passes. These are plenty enough to attend the huge rush of passengers. Afterward, there is an automated baggage drop. It has a similar kiosk that asks you to scan your passport and boarding pass. It weighs your bag on the spot and scans the baggage tag. The only sad part is this machine wouldn’t allow your baggage to pass even if it is 0.1 kilograms overweight. The machine won’t open to take your bag unless everything is correct. Terminal 4 uses 20% less manpower than conventional terminals. Even the border control process has been streamlined. Singaporean citizens, permanent residents, and visitors who have already registered their fingerprints with the Immigration and Checkpoints Authority (i.e. anyone spending any time in the city-state) can use the automated border control kiosks. It scans your face and matches your fingerprints to verify your identity. Visitors’ data is deleted after departure. We all agree that the security screening process is the most exhausting part. There are endless lines and you have to remove shoes, belts, jackets, electronic gadgets etc., it’s exhausting. But Terminal 4 uses a new CT scanner system that eliminates the need for removing electronics. Everything seems to be designed in a very thoughtful way. It makes the process much faster. And if you think this was not enough Changi airport is soon coming up with Jewel Changi Airport. Enjoy a whole new experience from mid of 2019; the mixed-use development features a hotel, exciting attractions, aviation facilities as well as retail and dining offerings – all across a 10-storey complex. There are going to be Petal Gardens, Canopy Bridge, Sky-Nets, Foggy Bowls, Forest Valley and many more things to take your breath away. There is a 40 meter high Rain Vortex which will be the world’s tallest indoor waterfall and is located right at the core of Jewel. 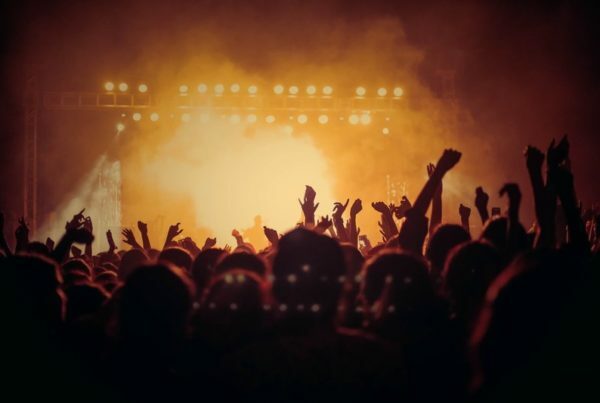 Come night-time, the Rain Vortex will transform into an enchanting Light and Sound show – there is no better way to spend a perfect night out with family and friends. So what are you waiting for, plan your vacations and make sure to have a long layover at Singapore Airport. It is going to be an experience of a lifetime. A fashion graduate with a dream to become a full-time Traveler one day and contribute towards the welfare of society through awareness programmes. I believe in magic I believe that everything will fall in place eventually. With a keen interest in writing, I want to write the finest inspirational stories to help others realize their dreams and believe nothing is bigger than our dreams. Copyright © 2018 Faltusaala. All rights reserved.